Bold Type Books, 9781568589596, 304pp. 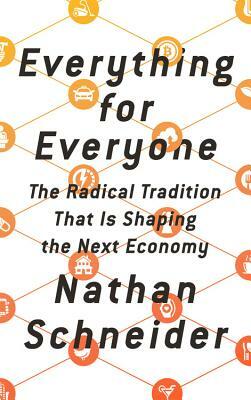 Everything for Everyone chronicles this revolution--from taxi cooperatives keeping Uber at bay, to an outspoken mayor transforming his city in the Deep South, to a fugitive building a fairer version of Bitcoin, to the rural electric co-op members who are propelling an aging system into the future. As these pioneers show, co-ops are helping us rediscover our capacity for creative, powerful, and fair democracy. Nathan Schneider is a journalist and professor of media studies at the University of Colorado Boulder. He has written for publications including Harper's, The New Republic, The Nation, the New York Times, and The Catholic Worker. This is his third book. Schneider lives in Boulder, CO.